Low Immunity. Get sick easily? Always feel sick?" Worn out feeling from chronic illness? If yes to one or more, you might have a glutathione deficiency. Called the "Master Antioxidant" Because It Binds Damaging Free Radicals! 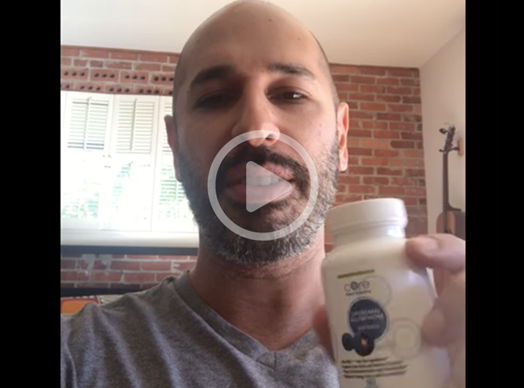 Liposomal Glutathione to Fight and Slow Down Aging! diseases like Parkinson’s and Alzheimers. in heart disease, metabolic syndrome and other chronic illnesses. Reduces the appearance of wrinkles and improves skin elasticity. This means you get brighter, healthier skin. is crucial for excelling on the field and in the gym. body through daily living in our modern polluted world. Objective: Glutathione (GSH) is the most abundant endogenous antioxidant and a critical regulator of oxidative stress. Maintenance of optimal tissues for GSH levels may be an important strategy for the prevention of oxidative stress-related diseases. We investigated if oral administration of liposomal GSH is effective at enhancing GSH levels in vivo. Conclusion: Collectively, these preliminary findings support the effectiveness of daily liposomal GSH administration at elevating stores of GSH and impacting the immune function and levels of oxidative stress. The study showed 5 microgram (μgm) (a very small amount) liposomal glutathione (but not control liposomes) was effective in decreasing oxidized LDL in human blood. A significant decrease in oxidation in atherosclerosis. Analyses of cellular cholesterol fluxes revealed that, liposomal glutathione (12.5mg/kg/day) consumption, decreased the extent of oxidized-LDL (Ox-LDL) uptake by 17% and the cellular cholesterol biosynthesis rate, by 34%, and stimulated HDL- induced macrophage cholesterol efflux, by 19%. Most important, a significant reduction in macrophage cholesterol mass (by 24%), and in the atherosclerotic lesion area (by 30%) was noted. We thus conclude that liposomal glutathione possesses anti-oxidative and anti-atherogenic properties towards lipoproteins and macrophages, leading to attenuation of atherosclerosis development. Normal, powdered glutathione is a very fragile three amino acid peptide. Studies have shown that "plain" powder glutathione doesn't survive stomach acid and digestive enzymes and doesn't get absorbed. 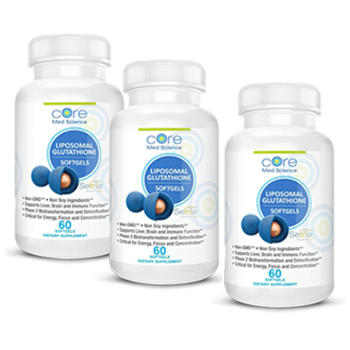 Liposomes are microscopic spheres which house and protect their contents. 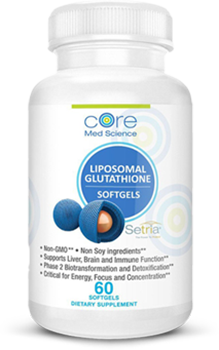 The liposomal structures in this product protect the glutathione from the harsh environment of the stomach and increase absorption as these spheres fuse with the cells of the small intestine where absorption takes place. That means this form of glutathione will reach circulation more efficiently and effectively. Glutathione is often referred to as the body’s “master antioxidant.” It fights against oxidative stress—a condition that is a natural byproduct of your metabolism but can lead to the excess production of free radicals and reactive oxygen species (ROS). Left unchecked, these molecules alter DNA, alter cell membranes, lead to cellular mutations, and generally overrun your body. The result are all of the downstream effects we experience as illness and aging: more wrinkles, less shiny skin, lethargy, fatigue, and even chronic conditions like heart disease, diabetes, and more. Air Pollution? Toxic Environment? Is Your Body Suffering from Toxic Overload? Glutathione is our Body's Main Detoxification Molecule. So glad I found your product. At a more reasonable rate than what I’ve purchased through my doctor, your product helps modulate responses to oxidative stress just as well, perhaps better. After going through breast cancer treatment, I changed my diet dramatically. Even with eating healthy and being more active, I had not gotten over the tired sluggish feeling I had. 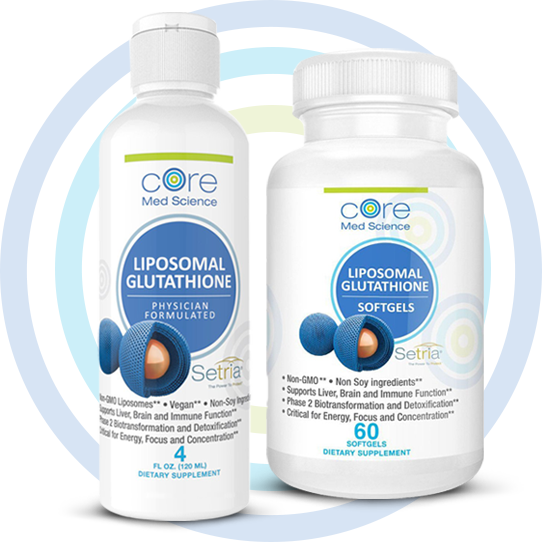 Optimized Liposomal Setria® Glutathione has restored my energy, given me an overall feeling of well being, and helped my “brain fog” to clear. Feeding your body at the cellular level is a smart move. I highly recommend this product from CoreMed Science, best one I have ever used - I tried several other brands, which did not have the positive result I have experienced with the CoreMed Science brand. 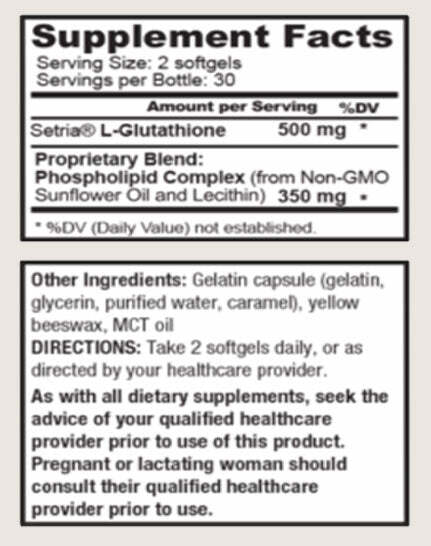 Both the capsule and liquid glutathione have a smooth flavor, no strong sulphur odor. I definitely experienced a gentle boost in energy within minutes. I appreciate Dr. Popa's effort to deliver an organic, non-GMO product and would recommend this product. Thanks for a true Liposomal product (China Free). Glad to see it is soy free and sunflower based. I love the boost in energy and overall feeling, and it taste better than the other brands. I would also like to thank you for your quick responses to my questions and fast delivery of your products. Thanks. Our products aim to be “best in class”. 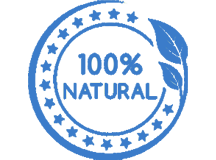 Yes, there are other liposomal companies out there, but we create our liposomes through a natural process using no extra heat, no additional pressure and no solvents whatsoever. 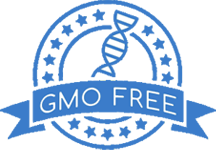 We use non-GMO ingredients and the water used to make our liposomes is extra pure. Additionally we use non-Chinese Vitamin C (Scottish Quali-C brand) and non-Chinese Glutathione (Japanese “Setria” brand). 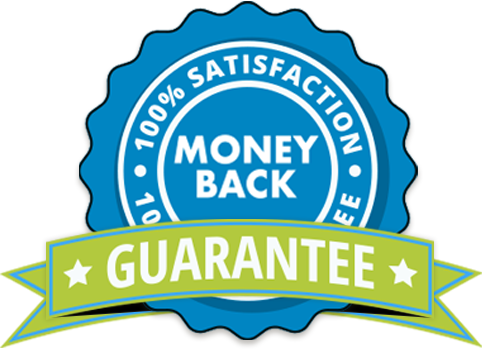 If you don't like the results of our Liposomal Glutathione don't worry, you can return it for a full refund in the first 90 days after your order. We want you to try this amazing product at no risk to you. 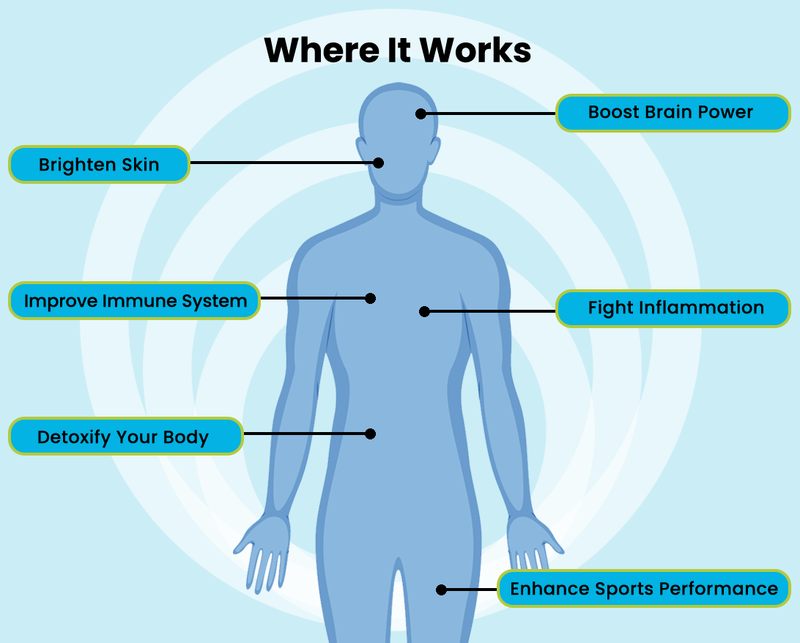 But rest assured, Liposomal Glutathione really works. Simply order today risk-free, and you'll be able to get all the benefits of our product. If you're unsatisfied for any reason, simply contact us and you'll get a prompt refund. 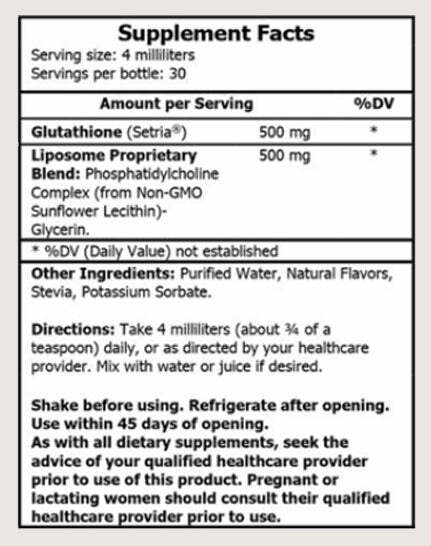 Simply put, if you're not absolutely thrilled with Liposomal Glutathione, then you don't pay anything. Guaranteed! your health and change your life!